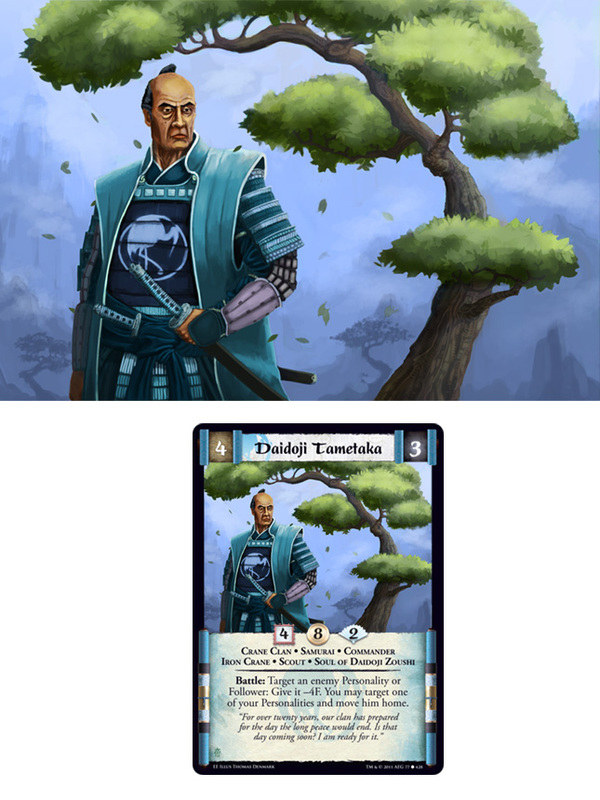 This is the final version of the Dadoji Tametaka remake. I'm glad it took a little less time than Sneak Attack, I think I'm starting to get into a regular rhythm for work like this. Unfortunately I'll have to take a month-long break while I get back to contract work (I work on a rather peculiar bi-monthly schedule) for Prison Architect. After that I'll have another free month, where I hope to put out two more remakes (a weapon and a location) and then submit that batch of work to Alderac to see what they think. One person made mention that the tree in the original piece looked rather awkward in that it had no dimensions, like it was just the perfect profile view of the tree. To remedy that I introduced some more branching and tried to control the lights and darks to suggest more volume to the tree. One commenter also suggested that I introduce some atmospheric perspective on the tree to push it backwards a little bit and give the piece more dimension. I did that ever so slightly, and now I worry that it's not noticeable enough. The last critique I'd like to mention also pertains to the tree. In the original piece the thickness of the tree truck towards the bottom becomes quite pronounced, making it seem like the ground is very much near the bottom of the artwork. 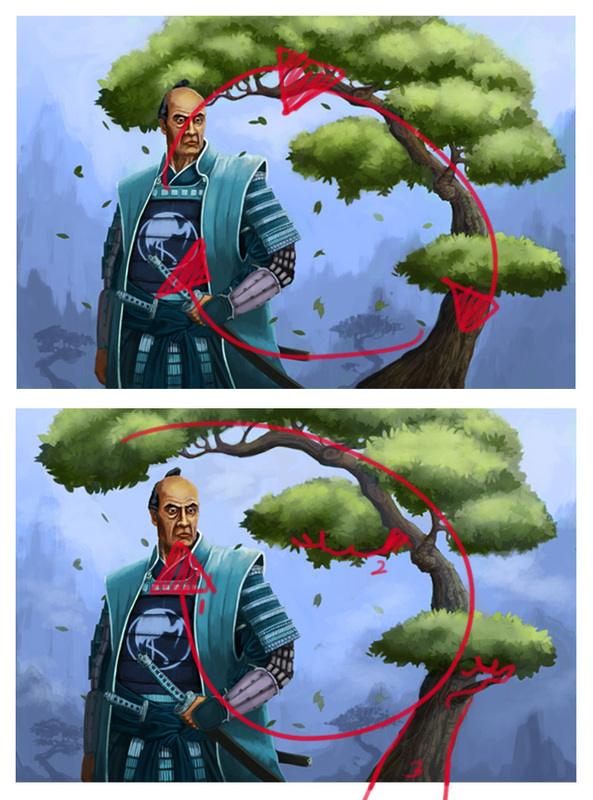 This is a problem because tonally the samurai and the tree seem to be in the same visual plane, meaning the samurai either has really short legs, or the tree is floating. The critiquer, Tinybird of the conceptart.org forums made this funny and useful image to help explain the problem. He was absolutely right. This happened because I was using a Bonsai tree as a reference , and unthinkingly copied the general shape of the tree without considering how it would look when it extends outside the frame. Well that wraps it up for this post. Hope you found reading about all of my mistakes useful! It's interesting how most of my issues had to do with the tree. I still have trouble with foliage, so maybe that's something to focus on when I'm sketching outside.